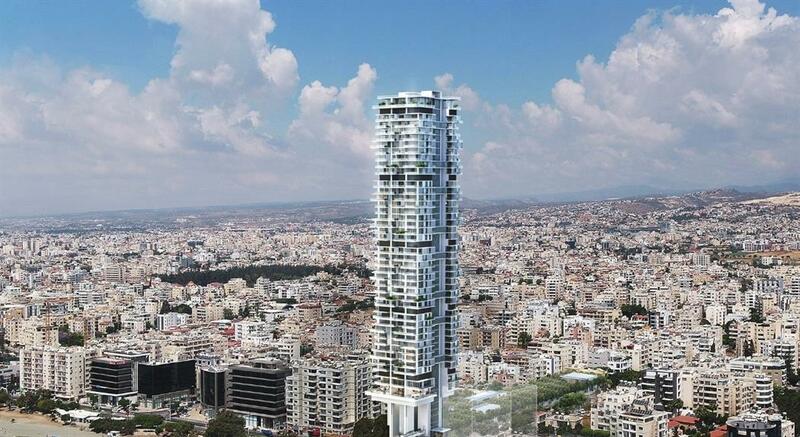 The Shacolas group is planning to demolish the Debenhams Olympia centre in Limassol to make way for the 197 metre high rise Aura development of luxury apartments that will be the tallest in Cyprus. Shacolas’ Woolworth Properties has already applied for a town planning license for the 197-metre-high tower of luxury apartments through its subsidiary Limassol Beach & Seaview Properties. A decision will be made at the municipality’s next meeting. Last week Interior Minister Constantinos Petrides said the government had issued building permits for 25 high rise buildings in the first three months of the year and and that 60 more were pending, most of them in Limassol. Designed by architects Foster + Partners, the Aura will consist of 137 two-to-four-bedroom apartments and a five-bedroom penthouse with panoramic views of the Mediterranean. The building is designed to look like it hangs over its landscaped gardens. The tallest building currently under construction in Limassol is the One, at 170 metres and scheduled to be completed in 2019. On its completion it will be the tallest seafront tower in Europe. Trilogy, another high rise development in Limassol consists, according to its developer, Cybarco, of three towers, the tallest of which will be 161 metres above sea level. It is slated for completion in 2023. Petrides said there are advantages to high rise developments as they leave larger open spaces, and that, contrary to common belief, they do not create a ‘visual wall’ along the sea but afford better visibility than lower wider ones. Under the new rules, studies of microclimate impact on growth will be evaluated, in relation to sunlight, shading, airflow, thermal effect, reflections and light pollution and any other studies that may be required in accordance with environmental legislation.